Blue Moon City, once the capital of the land, has been reduced to rubble. The long war of succession is over, and the various people left in the city are looking to rebuild. They are working hard to return the city to its former glory. But only one group will lead the reconstruction, and thus have the right to rule in this new age of peace. 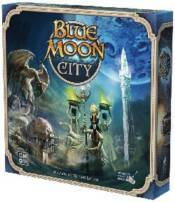 In Blue Moon City, players are looking to restore the buildings of the ancient capital. Collecting together work groups from among the populace, they add their contributions to the reconstruction efforts. When a building is repaired, it gives bonuses to any player that helped, but a bigger bonus to the one that contributed the most. Those rewards can come in the form of Crystals, which are offered up to the central Obelisk. Once a player has made the required offering, they will ascend to leader of Blue Moon City.